In providing a new level of convenience, low price, and efficiency, Wal-Mart has substantially changed the rules of our global economy, the customer expectations for every business--and the ways your organization must deliver to keep up. William Marquard designed Wal-Mart's first-ever strategic planning process and ran it for three and a half years--then spent the next seven years competing against that strategy as a Fortune 200 executive and as an advisor to other firms. Marquard's insights from both inside and outside Wal-Mart enable leaders of all organizations--public and private, manufacturing and service, local and international, large and small--to respond to the challenges posed by dominant industry players like Wal-Mart. 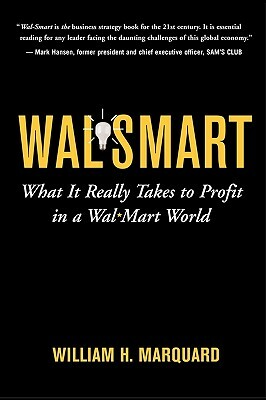 Wal-Smart is not just a book about Wal-Mart. Wal-Smart starts by exploring the elements of Wal-Mart's success that few people see: its productivity loop, its powerful process disciplines, and its hidden management "DNA." It then crafts compelling strategies that any company in any industry can use to survive and thrive in this brave new Wal-Mart world.